The Cowboys celebrate after walking off to victory in Wednesday’s 1A state semifinal. It took 22 years of waiting, but the Madison County Cowboys made it worth every second for manager Terry Barrs. 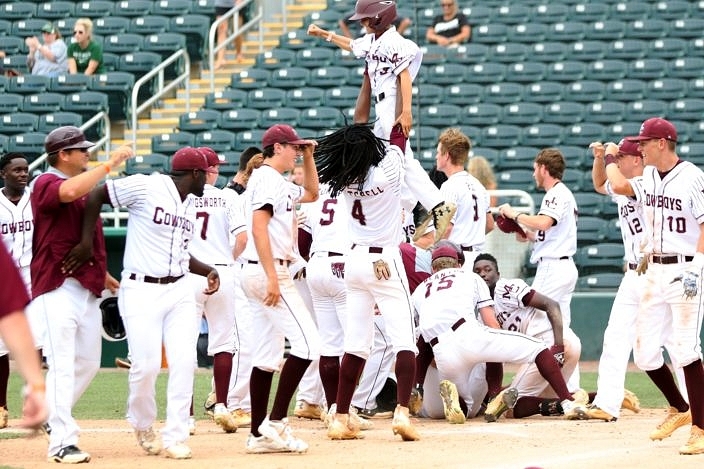 Competing in their first state tournament in program history, the Cowboys rallied back to earn a 4-3, walk-off victory over South Walton in a 1A state semifinal at Hammonds Stadium in Fort Myers on Wednesday afternoon. Dilan Lawson sent a flare into shallow right field for an RBI single that sent Tre Adams sliding across home plate and into Thursday’s state championship. Madison County will face Trenton Thursday afternoon in the 1A state final. 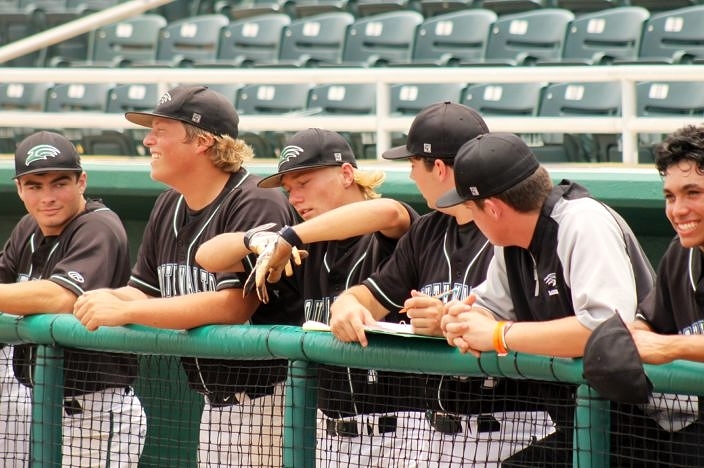 The Tigers (26-1) advanced with a 10-0 victory over Sneads in the other 1A semifinal on Wednesday morning. Truer words were ever spoken. Despite falling into a 3-1 hole midway through the action, the Cowboys (19-10) never wavered in their belief that they would write their happy ending to this chapter of their season. The team rallied for two runs that evened things back up in the bottom of the fourth, before finishing off the rally with the deciding run in the bottom of the seventh. 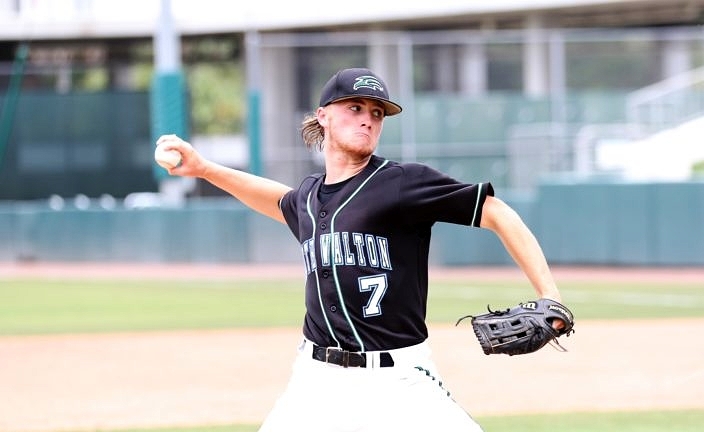 South Walton ace Adam Richards went the distance, allowing four unearned runs on six hits and two walks. That one more game was made possible thanks mainly to junior catcher Dustin Bass, who started off the bottom of the seventh by drilling a shot to left field and then racing all the way around the bases for a triple. Bass then gave way to the courtesy-runner, Tre Adams, who admitted he knew all along that he was going to score and end it with Lawson coming to the plate. It was a different kind of pain for the Seahawks (23-7) after coming up a game short of their dreams. The team did not want the season to end after all they have experienced together this year. 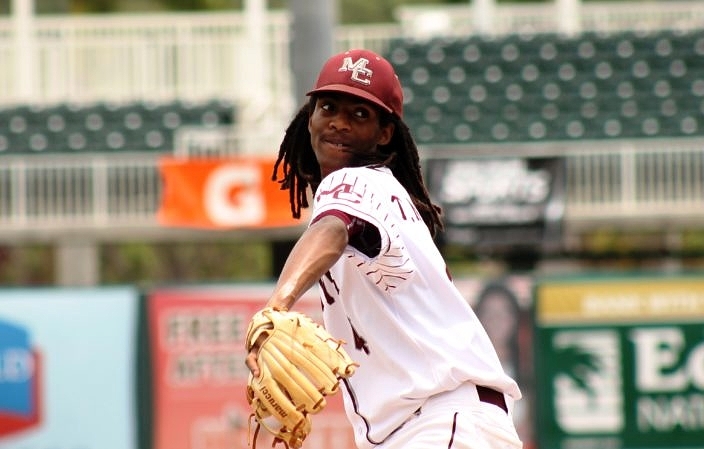 Trey Mitchell made the start for Madison County. Senior shortstop Austin Garofalo is one of those leaders that has set the tone all year for the club. Garofalo led the state of Florida with 15 home runs this season, and he delivered another big performance in Wednesday’s action by reaching base three times and being involved in every run scored. After Tyler Holland singled to lead off the third, Garofalo put the ball in play to reach on an error that kept things going and set up Harris Barton for an RBI walk. The following inning Holland was hit by a pitch and then came all the way around to score when Garofalo sent a liner into the left-center field gap for an RBI double, before he also scored off a passed ball. “You tip your hat to him; he hit an off-speed pitch and drove the ball well,” Barrs said of Garofalo’s hit. Although the end result was not the desired outcome for the Seahawks, it does not change the season they had and the memories that will last forever. South Walton’s Tyler Holland dances to the pregame music at Hammond Stadium. Cowboys Leadoff hitter Kris Allen played a large role in the comeback. Drew Herring reached on an error to start the third inning, advanced off a walk to Jatavious Price and then stole third base to get into prime scoring position. Allen then delivered an infield RBI groundout that got Madison County on the scoreboard. The following inning Allen supplied the final piece of the rally that tied the game back up. Jaebion Mitchell doubled to right field as part of an impressive 3-for-3 performance and Drew Annett was hit by a pitch to put two runners on base. Herring delivered an RBI single to right field, Price reached on a bunt single and Allen lifted a fly ball deep to center field for a sac-fly RBI that allowed Annett to easily tag up and score the tying run. Madison County was aggressive early in counts against Seahawks ace Adam Richards, putting the ball in play and relying on speed and athleticism to help generate offense. The team connected for eight hits and had base runners in all but the first inning.